New Delhi: The Supreme Court did not interfere with an ongoing probe into a strike by junior doctors of a Uttar Pradesh hospital which had allegedly led to the death of several patients, but decided to hear an appeal against Allahabad High Court verdict directing the authorities to penalise them. “Let the inquiry go on,” a bench headed by Chief Justice T S Thakur said when senior advocate Sidharth Luthra was making submissions to assail the order of High Court which had also directed that Rs 25 lakh compensation be given to each family, the amount of which would be deducted from salaries, stipend and allowances of the striking doctors if deaths were found to have taken place due to the strike. The bench, also comprising Justices D Y Chandrachud and L Nageswara Rao, issued notices and sought response of the state government, Health Department, Director of Medical and Health, Vice Chancellor of King George Medical University and an individual on whose PIL the High Court had delivered the judgement. Luthra, appearing for the doctors’ body, Medico-Legal Action Group (MLAG), stressed that the direction to recover the compensation amount from the striking doctors will lead to many complications and therefore it needed to be examined by the apex court. MLAG has challenged the June 2 verdict of the High Court asking the state government to form a high level committee to probe the matter within two months. It said the high court had passed the order against the medical practitioners who were not party to the case and were also not heard but saddled with the possibility of deduction of a huge amount from their salary. “The members of the medical profession, who are already under great stress because of several legal provisions and judgements against them, would be further demoralised by judgements like the impugned judgement and this would result in further demotivating bright and deserving young persons from opting to pursue the medical profession in a scenario where there is a shortage of doctors in the country,” the special leave petition (SLP) said. Fundamental Rights are part of Democracy, if the Judiciary feels Stricks are unlawful, it should implement it to each every one , selectively imposing on one particular community is nothing but act of Discrimination. Which is against the.basic principle of law. It is really sad. Younger generation is already despiseing the profession and with this the situation will be worse. First improve the situation then think of all this. What is the way of protesting when nobody listen to you. This is the democratic right of every citizen to protest. And what about others they can do that but only the doctors can\’t. Doctors are soft target in every respect and our esteemed associations sleeps. A dangerous trend. 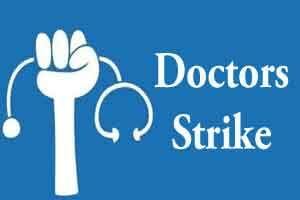 Doctors have only duties and no rights..They have no right to strike, no right to a quality life, cannot err (but everyone else can, like judges, lawyers, politicians, engineers, businessmen, clerks etc.). What nonsense is going on? What these moron judges are doing? They have no idea what it takes to become a doctor and to be a doctor. Minimum qualification for judges who are rendering medical judgements should be MBBS besides law degree.They should have some basic knowledge of this profession.